Dell has informed UK tech fans that its newly-announced range of Inspiron R laptops will not bring the optional touchscreen offered to buyers in the US. The company revealed the new Windows 8-infused Inspiron 15R and 17R at the CES expo in Las Vegas, with consumers able to choose whether they would like a touch sensitive display. However, the company has informed PCPro that: "none of the Inspirons announced at CES available in the UK will have a touchscreen." As to why Dell doesn't trust us Brits with the touchscreen option remains to be seen. However, it's not all bad news. The new Inspiron R laptops boast a six-cell battery and new low-voltage Intel Ivy Bridge processors, meaning longer battery life. 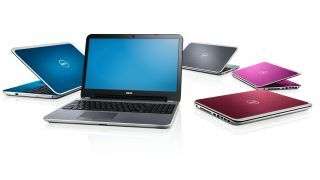 The Inspiron R will come in 15.6-inch and 17.3-inch models and will start at £399. Custom configurations will be available, with full HD resolution screens, and Intel's i7 processor, depending on the user's demands.